Watercolor: Basics teaches aspiring artists everything they need to know to get started in watercolour painting. This versatile and fluid medium has an unpredictable nature that can make it appear intimidating to the novice, making Watercolor: Basics the perfect introduction to a breathtaking and lively medium. With a comprehensive introduction to tools and materials, Watercolour: Basics guides the artist in selecting the appropriate paints, surfaces, brushes, and additional materials needed to become a master in watercolour. 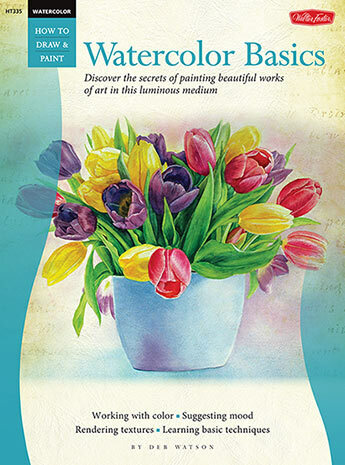 Additionally, the book covers basic colour theory and watercolour painting techniques, including how to create washes, work with masking fluid, mix colours, and render textures. Artists will learn to master the art of watercolour through a series of easy-to-follow step-by-step projects covering a variety of subjects, including landscape, still life, portrait, and more. Along the way, artists will discover tips and suggestions from a professional artist as they learn how to render light and shadow, achieve a range of textures, suggest mood or time of day, and bring dimension and depth to their art. With expert instruction, a breadth of coverage, helpful tips, and colourful art, Watercolor: Basics is the perfect resource for artists wanting to get started in this luminous and expressive medium.